1-2-3 i found myself on a one way street with the only chance of a dead ending. and i felt so inflamed to end up here again. quite the in-frangible.i stand in a maze. the oppression of interaction and quiet thoughts loom. no one cares until they are then they are speechless. because who knows how to scream when all is silent. i know something is wrong when on a train car of possible interactions. on friday i buried my head in my pillow and it was all tears. i think that was triggered. voice spoke in my brain and said "keep going"
too many people are silent here like i'm the last one alive. but your brain will speak so loud. they will rip you off. 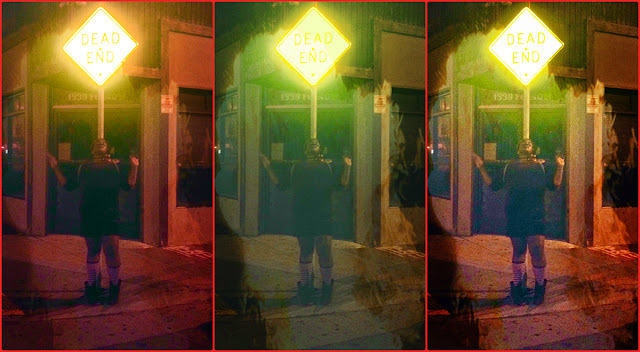 Another one way, dead end.